"Be a Santa to a Senior" helps bring smiles and joy to seniors who need it most in your community this holiday season with Home Instead Senior Care. 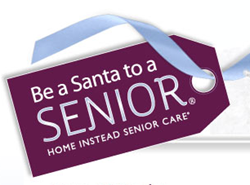 Home Instead Senior Care is ready to spread holiday joy this season with their Be a Santa to a Senior® program! For the past six years, Home Instead has partnered with local nonprofit and community organizations to identify seniors who may not receive gifts this holiday season. The company then reaches out to local businesses and retail stores to help arrange the purchase and distribution of gifts by placing trees in their locations that contain gift tag “ornaments” with gift requests for each senior. The trees go up in Wesley Chapel participating businesses on Wednesday, November 5th until Monday, December 15th. In Clearwater, trees will be up from Monday, November 3rd until Friday, December 19th. This year, 52 Walgreen’s locations in Pinellas County and 12 Bealls Outlets locations will host trees in their stores as well. The customers that shop at these locations choose a gift tag from the tree and buy gifts for their designated senior. These gifts can be anything like toiletries, games, or pajamas. Once the gifts are purchased, they can be brought back, unwrapped, to the same store or to a Home Instead location. Be a Santa to a Senior volunteers regularly collect gifts and replace gift tags as needed and also deliver the gifts to each senior. This program has attracted 60,000 volunteers and has delivered 1.2 million gifts over the past six years. Be a Santa to a Senior helps brighten the lives of many seniors around the holiday season, a time when no one should be alone. All parties who participate experience a rewarding experience from this wonderful program. Home Instead Senior Care would like to thank this year’s Be a Santa to a Senior corporate sponsors Deliver Media, JSA Medical Group, Ricoh USA, Walgreen’s, Bealls Outlets and Brighthouse Networks. Founded in 1994 in Omaha, Nebraska, by Lori and Paul Hogan, the Home Instead Senior Care® network provides personalized care, support and education to help enhance the lives of aging adults and their families. Today, this network is the world's leading provider of in-home care services for seniors, with more than 1,000 independently owned and operated franchises that are estimated to annually provide more than 50 million hours of care throughout the United States and 16 other countries. Local Home Instead Senior Care offices employ approximately 65,000 CAREGiversSM worldwide who provide basic support services that enable seniors to live safely and comfortably in their own homes for as long as possible. The Home Instead Senior Care network strives to partner with each client and his or her family members to help meet that individual’s needs. Services span the care continuum from providing companionship and personal care to specialized Alzheimer’s care and hospice support. Also available are family caregiver education and support resources. At Home Instead Senior Care, its relationship before task, while striving to provide superior quality service. Deliver Media, a Tampa, FL based marketing and advertising company, is proud to be a corporate sponsor for Home Instead's Be a Santa to a Senior program. Deliver Media works with Home Instead Senior Care to bring awareness to the needs of seniors.